There are many ways to learn and practice mindfulness, but the evidence shows that having a teacher or guide to learn from and practice with is by far the most effective way to understand and get the benefits from the practice. This can take place in your home, workplace or in a studio rented by the hour. 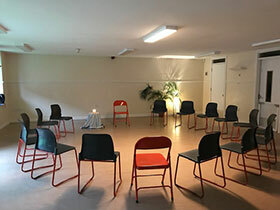 This can be offered as an Introduction Day or Afternoon, part of the company’s Wellbeing initiative, or regular scheduled sessions in the workplace. Offering employees a ‘space’ for time-out, re-focusing, re-connection, de-stressing and clarity not only improves their wellbeing, but the atmosphere of the entire workforce. These are organised throughout the year and are an enjoyable way to learn as well as a chance to practice with others. Group meditation practice has a powerful effect. See ‘Events’ page for upcoming sessions. I see my role as not only to guide and teach you, but to make the Meditation practice as accessible for you as it can be, to make it relevant to your personal lifestyle, and to be there to support you when you have questions or when life’s curve balls throw you off course.